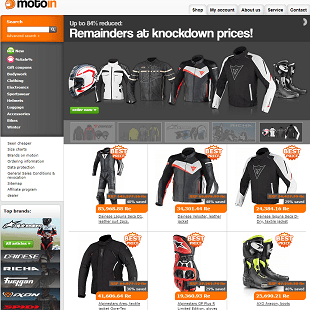 motoin.de has over 10 years of experience with motorbike clothing and accessories, so you can rest assured that any product on the site has been hand-picked from the best on the market. 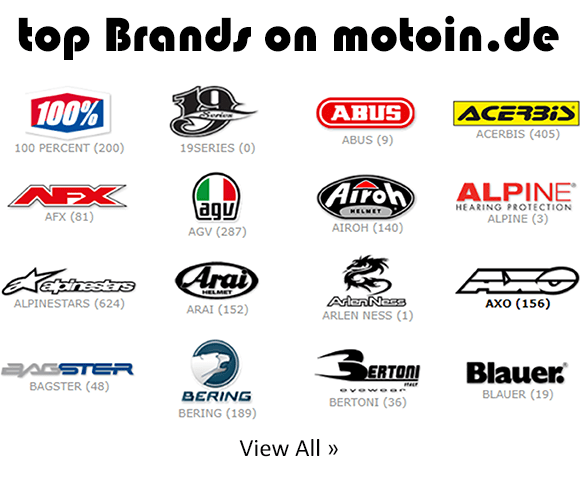 The well-known e-commerce brand motoin GmbH (motion.de) is the go-to place for any true motorcycle enthusiast looking for quality biking gear and accessories at an attractive price. 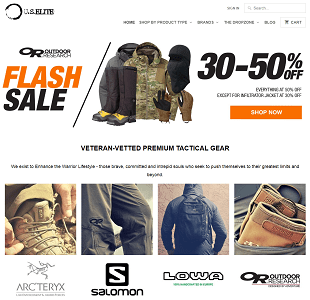 The company has been expanding its product selection over the last 10+ years, and now offers more than 145,000 items in their e-commerce store. They have a showroom with a wide variety of these items, as well as the option to try any of your purchased items before taking them home. So, if you find yourself in Aachen, Germany, opt for a Self Pickup and pay them a visit! 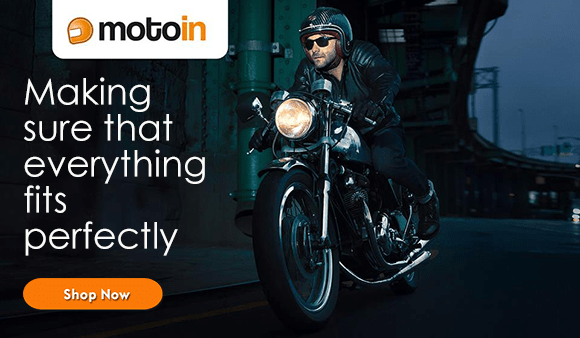 If you’re elsewhere in the world, not a problem – motoin offers worldwide shipping for your convenience and they have shipped to customers everywhere, from Europe to Australia. As a fun added-bonus, purchases over 20 euros receive a free gift! 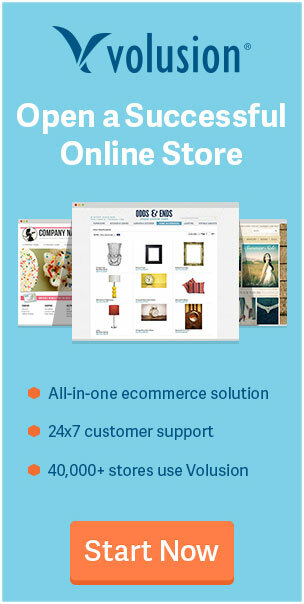 The e-commerce company was founded in 2007 by Marcel Maaßen and Farshid Chalatbari. Together, they offer over 10 years of experience with motorbike clothing and accessories, so you can rest assured that any product on the site has been hand-picked from the best on the market. The customer service provided by motoin is very competent and they make every attempt to ensure their customers are 100% satisfied with every order. You can find a plethora of information on the website to aid with your purchase, including many helpful FAQs answering questions about ordering, payment, delivery time, and more. If you order a product and decide to cancel or change the order, feel free to contact the service department (as quickly as possible) at service@motoin.de with your order number. They’ll be happy to make the changes for you. Feel free to call as well using their dedicated phone service. The website provides a detailed description of the materials used in each of their products and dedicates an entire page to each one with photos. This alone is an incredible advantage to anyone purchasing clothing online. For example, the brand Airack manufactures bike jackets. The motoin website explains the technology behind the jacket and how the various built-in air vents keep the jacket cool throughout your ride. There is also a page dedicated to size charts for each brand to ensure you choose the correct size every time, no matter what you purchase. While size charts do not match with everyone’s body, there are many reviews with compliments on how well the clothing and accessories fit. Most of the size charts are very detailed with height, chest and sleeve measurements for shirts/sweatshirts, and there is even one for gloves, with measurements for hand circumference. Some of the charts also provide German and US sizes for convenience. motoin conveniently accepts various payment methods within the EU: SOFORT Uberweisung, PayPal, Visa, MasterCard, American Express, advance payment and cash-on-delivery. If you live outside the EU, you may pay with advance payment, PayPal or credit card. The site offers an explanation of each payment method, so you can easily compare them and decide which is best for you. Prices are listed in currencies other than Euros, but they do note that these are approximations. You will see a price in euros in the final step of the checkout process, and your bank or credit card will be responsible for the currency conversion based on the most up-to-date exchange rate. Previously, there have been negative reviews about shipping and lost packages. motoin always takes the time to carefully ensure each customers’ issue has been resolved, even when concerns are with the courier. Each and every negative review has been thoughtfully responded to on every major review website, including Facebook, with the intent of solving every matter. Currently, they ship with DHL and UPS and have had very few, if any, recent issues with either. Customers from Scotland to Mexico have all been very happy with their purchases. Occasionally shipping has been known to be a bit slower outside of Germany, but that is due to customs and the like. Some products may also be back-ordered which will slow the order down, but these are rare cases. DHL and UPS delivery times vary based on the package’s destination country. A flat fee of 4.9 euros is charged inside Germany, and rates vary depending on where your package is being delivered elsewhere in the world. Here’s a chart which shows shipping fees based on country. If you do have a package delivered in Germany, any order over 250 euros will receive free shipping! Product returns are allowed for 30 days, plus a money-back guarantee on all returned products. 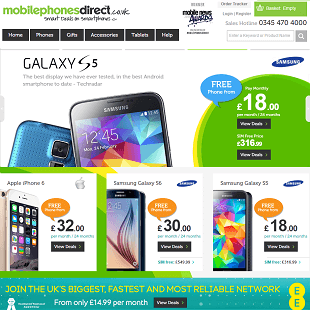 Phone service is available to answer any questions you may have about your products and the ordering process. 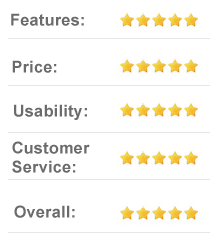 Over the years, motoin has collected many great reviews from several reputable websites. They boast an overwhelming response from customers in the 5/5 star category, with an average of 4.75 on Trustedshops.de, including over 145 five star reviews, and only 18 reviews at four-star or below. Compliments most recently have been about processing time, good communication and quality products. The few complaints are about slow delivery time (which most often happens outside the country), and slow refund rate (which is determined by the product being delayed in transit). A handful of lower ratings mentioned products selling out before their orders were processed. These products happened to be “special items” that many customers wait for and grab as quickly as they can, knowing the limited quantity and great value. These items are clearly marked and explained on the website so anyone may take advantage as quickly as they can! Collecting a respectable 4.9/5 on Idealo.co.uk with over 600 reviews raving about how well the clothing fits, the comfort of the biker boots, ease of the shipping process across the globe, and how great the service is when dealing with motoin. They’ve maintained a partnership with Idealo since 2013. In the category of Motor, Sport & Outdoor, motion won the award for Top Shop 2017. The German company Computer Bild compiles the top 750 online shops that are easy, safe, and convenient to purchase from. 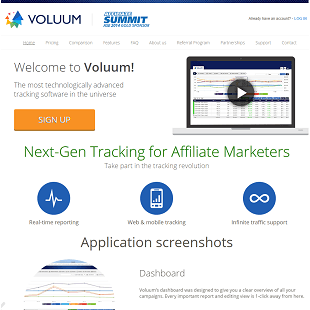 This is a great ranking project because it is very easy to be scammed online. Even with legitimate e-commerce stores, there are many websites that are confusing, have non-transparent payment methods, and very few payment options. Germany has developed very high legal standards for online stores, and the testers of Computer Bild only choose those that comply to the rigorous laws, such as the way the “buy” button is labeled in an order. The Top Shop award is one of the most extensive online shop tests done in Germany (using over 170,000 tests). To simply be included in the survey for the chance to earn the coveted seal of approval, each shop must offer a first-class shopping experience with encryption, price transparency, and be a well-known, popular brand. Computer Bild starts with over 8,000 e-commerce shops and they begin to narrow down the eligible shops from there. Each website goes through a series of tests, one being a point comparison including 115 different characteristics from subjective criteria like website appearance, and objective standards like payment options. As a Top Shop, motoin complies with every stringent law that Germany has created for e-commerce stores, including the protection of your data and payment information. motoin takes the time to support their local community and a clean environment. With Polizei Dein Partner, motoin is a supporter of the German police prevention work projects. Germany has many prevention programs throughout the country, from federal-scale to small work with local communities to prevent crime, creating a safer environment for everyone. For example, this includes programs for schools to teach various forms of discrimination, with the goal of promoting a peaceful coexistence in school. motoin has made an effort to specifically choose Domain Factory as the domain provider for their website. Domain Factory contributes to green energy projects around the world, from building hydroelectric power stations in Indonesia and Guatemala, to many wind power projects in India. By investing in these technologies, the emissions produced by Domain Factory are essentially “zeroed-out”. 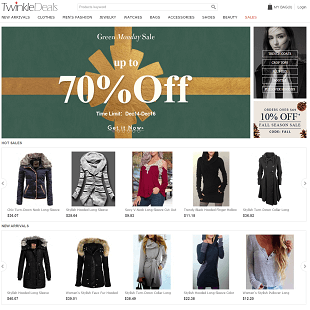 The company offers sale prices through their Facebook, Twitter, and Instagram pages for specific lines of products and special seasonal entire-store discounts. They also have coupons available on other websites such as newdiscountcodes.com and are constantly creating new exciting offers you can easily watch for on your favorite social page and take advantage of! In my opinion, any company that remains active on social media and interacts with customers in a very transparent way, is a trustworthy business worthy of my purchases! With founders who are passionate about the products they’ve compiled on their e-commerce store, there’s no doubt that everyone serious about motor biking will find something they like with the high standards expected for the sport clothing and accessories, and competitive prices to match. 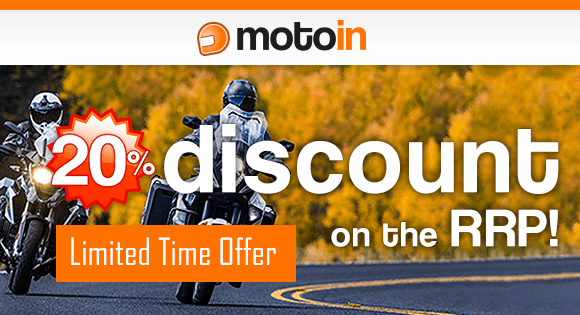 Easily stay updated on new product lines, special discounts and promotions on the official motoin.de Facebook, Twitter, and Instagram.